The basic legend of Nang Nak concerns a recently married couple, Nak and Mak, who lived in a wooden house alongside Phrakanong canal. During the Siamese-Vietnamese war (1831 to 1834), Mak is called away to fight. Mak leaves behind a pregnant Nak. Unfortunately, while Mak is away in battle, Nak goes into labour alone and due to complications during childbirth both the mother and infant die. However, due to her extreme love and devotion to her husband, Nak’s ghost remains in the house, waiting for his return. 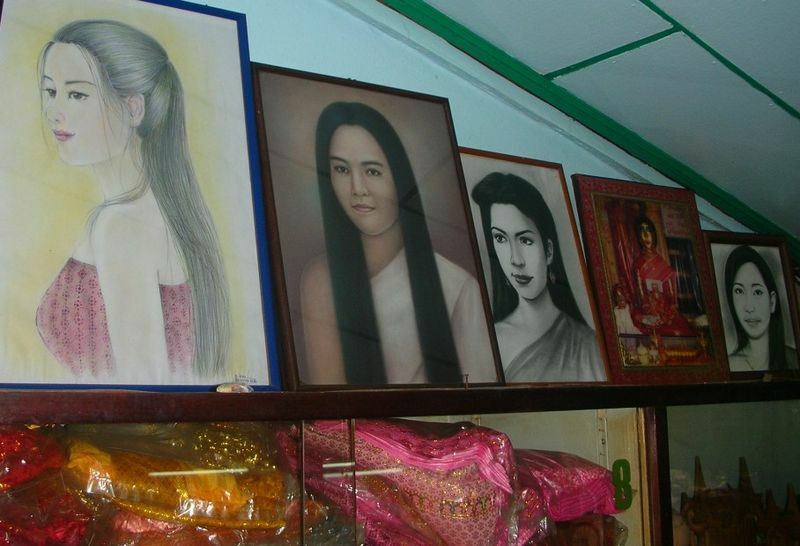 The locals in Phrakanong discover that Nak has died, but are scared away from her house because they can hear her ghost crying and occasionally see her image along the canal, waiting for her husband. As a result, the locals are terrified and steer clear of her house (paddling on the other side of the canal if they do have to pass by). Mak survives the war and returns home to Nak. Upon his return, he finds his wife and infant son waiting for him. At first, he does not realise that his wife is a ghost. When in Phrakanong market, the locals try to warn him about his wife, but he refuses to believe them. However, at home he starts noticing strange events and eventually realises the truth that his wife and son are dead. What happens next has a bit of variation depending on the different versions of the story, but the common event is that a monk is called to exorcise Nak’s ghost and return it to peace. The monk eventually succeeds and Nak’s ghost is said to be housed in a shrine within the local temple, Wat Mahabut. The legend of Nang Nak has been retold many times in various version in Thai film. In fact, it is one of the most popular stories to be told in Thai cinema (perhaps second only to Thailand’s famous love story, Ku Gam). The first time this legend was told in film was in about 1984 (I recall seeing it in cinema in Thailand at the time). Unfortunately, this movie seems to be no longer available and I even struggled to find reference to it on the internet. In 1999, a film entitled Nang Nak was released, which was the biggest Thai film released that year and which would remain until 2013 as the best version of the Nang Nak legend. This movie has excellent casting, and tries to be as true as possible to the original story. In 2005, British Director Mark Duffield had a go at presenting a modern version of the Nang Nak tale in his film, The Ghost of Mae Nak. Set in modern day Bangkok, the film follows recently married couple Mak and Nak, who are looking for a new house. They eventually find an old home along the banks of Phrakanong canal which they obtain for a very low price. It turns out this was the original house that Nang Nak lived in. Although it is a big twist on the original Nang Nak tale, this is not a bad movie and recommended for Nang Nak fans. In 2012, Thailand produced a Mae Nak Phrakanong play, that performed during that year. I never saw it, but from what I heard, I don’t think I really missed anything. 2013 was a real watershed and is perhaps the point where this ghost story finally gained international attention. The film Pee Mak Phra Khanong was released and this became Thailand’s highest grossing film ever (even beating the likes of Ong Bak). The story fairly closely follows the version as told in 1999’s Nang Nak (other than the ending), but adds a very strong comical aspect to the film that makes it watchable even by those who are usually too scared to see horror movies. To date, this is my favourite Thai movie and the actors do an excellent job (they even explain away Mak’s (played by Mario Maurer) half European features by explaining that his father was a missionary). The actress playing Nang Nak, Davika Hoorne, is absolutely gorgeous. However, I still maintain that the most faithful retelling of the legend is the 1999 version. There are other versions of this legend in film as well, but most of those would be very much a B grade production (and most are no longer available). 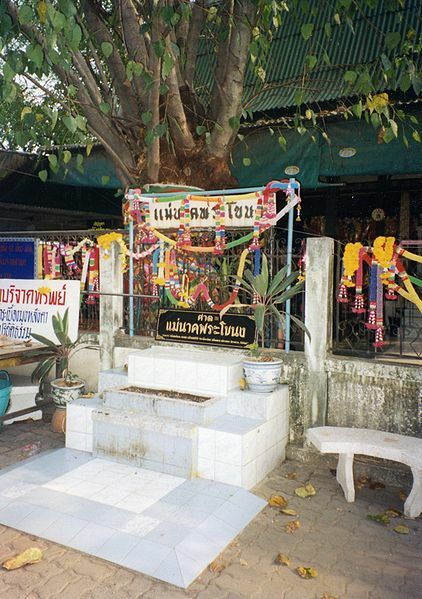 Wat Mahabut, located along Soi 77 off Sukhumvit Road, is where the shrine dedicated to Nang Nak is located. There is a statue of Nak, together with her son, as well as many paintings of her. 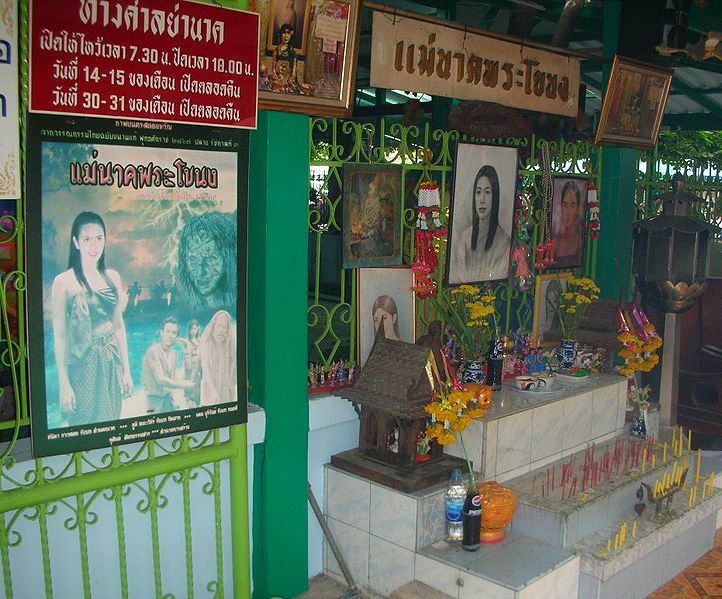 Thais will often go to the shrine to pay respect and pray to her for either an easy childbirth or else to pray for their husbands to avoid military conscription (conscription is done via a lottery system in Thailand). Did the Events Actually Take Place? An article dated 10 March 1899 in the Siam Praphet Thai newspaper referred to a Amdaeng Nak, the daughter of a subdistrict chief within Phrakanong. In the article, it recounts that Amdaeng Nak died while pregnant. She had an existing son, who was worried that her father would remarry and he would have to share his inheritance with a step-mother. As a result, he dressed in women’s clothing, threw rocks at passing boats and effectively created the ghost story in order to prevent his father from being able to find a new wife. Thais are so fearful of ghosts that the father would be too scared to find a new wife, and no local woman would dare to marry a man whose dead wife’s ghost continues to follow him. Growing up in Phrakanong in the 1980s was an interesting time for me. There was no internet and the ghost stories were all passed on orally by the locals. Parents used the Nang Nak story to keep their children in check. For example, parents used to tell their daughters to make sure they come straight home from school or else Nang Nak would catch them. It was very effective. On nights when the moon was full and all of the local dogs would start howling in unison. the locals would all huddle up in fear indoors, believing that Nang Nak was outside walking the streets, looking for her missing husband. However, in more recent times, thanks to the power of information sharing via the internet, a lot more of the story has been revealed, and it seems that the truth behind the legend has been revealed. Notwithstanding that, the tale itself, as it has evolved over the years, is quite beautiful yet tragic. I can certainly understand the attractiveness of the tale in Thailand as it represents another variation of the star-crossed lovers, who even in death, cannot be parted.